Gabriel Boboccea, owner of GNG Limousine, approached me while I was shooting a wedding down in Gloucester MA. Gabriel had a beautiful stretch Hummer limo and an amazing red-carpet service; you would have thought the bride was a celebrity. His website needed a lot of work, however we managed to come up with this great new design. 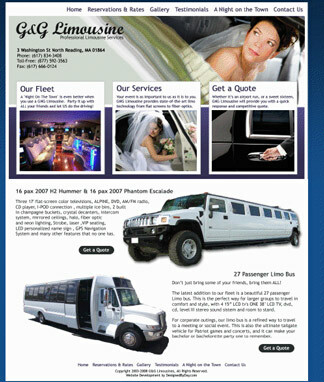 His website flourishes, getting dozens of views and quote requests for his limo service every day.